Tour Description Private land tour with well selected hotel, the cities connected by overnight comfortable Z train ( Soft Sleeper ) Private Guide and driver only for your family. You will see the most classic tour sites of China - Great Wall of Beijing, Terra Cotta Army Warriors in Xian, the Bund, Nanjing Road, Yu Garden at Shanghai Etc. Tourist spot：Mutianyu Great Wall - 798 Art Zone - Peking Duck Banquet. After breakfast, The morning itinerary will take you to Mutianyu Great Wall, you will take cable car to see this vital section of the world famous China Great Wall, Mutianyu has a history of over 1400 years, can trace back to Northern Qi Dynasty (550-570). Standing on the wall and looking at it stretching up and down into boundless distance is an exciting experience. Next you will visit Beijing 798 Art Zone, which is Located in the northeast suburb of Beijing, the previous factory plant has become a haven for artists from home and even abroad. Artists gather here to open galleries, art studios and cafes, and hold all kinds art events, making the area the most resounding name in the artistic circle. In the evening, you will enjoy an authentic and delicious Peking Duck Banquet. 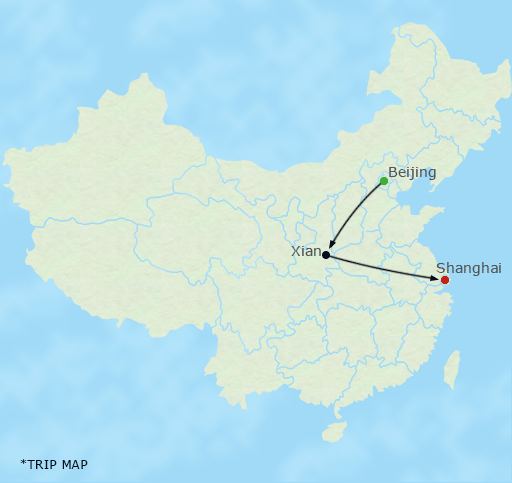 Tourist spot：Terracotta Warriors and Horses Museum - Great Mosque - Folk House - Shadow Play Opera - Tang Dynasty Dinner After in arrival Xian in the morning, the local guide will meet and transfer you to the downtown area to check in at the hotel. Breakfast will be arranged at the local restaurant, KFC or MacDonald. Then, you will visit the Terracotta Warriors and Horses Museum, the most significant archeological excavations of the20th century. It has been regarded as THE 8TH WONDER OF THE WORLD! After lunch we will visit the Great Mosque, is one of the oldest, largest and best-preserved Islamic mosques in China, the Muslim Street is the hub of the Moslem community in Xian City. After visit Muslim street, you will have a optional tour which is tour to GaoYue Song’s ancient style Folk House, formerly high rank official during the Ming Dynasty some 300 years ago. This house won UNESCO Prize for Cultural Heritage Protection in Asian-Pacific Area in 2002 and you will be delighted to see a dying art: Shadow Play Opera which played by farmers. Dinner enjoy famous Tang Dynasty Dinner. Tourist spot：Big Wild Goose Pagoda - City Wall - Shaanxi Provincial Museum After breakfast at hotel, you will visit the Big Wild Goose Pagoda, which situated at south of the Xian city, as one of the main constructions in the famous Buddhist temple-Da-Ci-En Temple, the pagoda is one of the most distinctive and outstanding landmarks for Xian City, the City Wall, It is the most complete city wall survived in China as well as one of the largest ancient military defensive systems in the world, Shaanxi Provincial Museum, which is the largest comprehensive museum in the province. Transfer to airport to take an afternoon flight to Shanghai. Upon arrival, meet your guide and then transfer to your hotel. Tourist spot：Shanghai Museum - Jade Buddha Temple - Nanjing Road - Bund - acrobatic show Meet the tour guide at the main lobby of the hotel and setout to visit the Shanghai Museum which houses 110,000 historical objects and 430,000 reference pieces, followed by a walk on People's Square. Later, Jade Buddha Temple, named for its two jade statues of Sakyamuni. One was carved out of a single piece of white jade weighing one ton. After lunch, proceed with a promenade of famous Nanjing Road, the busiest commercial center in Shanghai. Then, you will visit the Bund, a five-block riverfront lined with many of Shanghai's banks and trading houses. Last, after dinner, you will enjoy an acrobatic show with breathtaking motorcycle performance or Huangpu River Night Cruise Trip. Tourist spot：Yu Yuan Garden - Shanghai World Financial Center - Tianzifang alley After breakfast, Head to Yu Yuan Garden and Old Bazaar. This classical Qing Dynasty garden has over 30 pavilions linked by a maze of corridors and bridges over ponds. You will be arranged to have lunch in Yu Yuan Garden area. In afternoon, you will first visit the Shanghai World Financial Center, which is located in the center of the Lujiazui Finance and Trade Zone. With 101 floors above ground level and soaring to a height of 492 meters, this project embodies Mori Building's original Vertical Garden City concept. It is a hub of culture and information, and boasts state of the art security. The last stop is Tianzifang alley. Tianzifang has transformed itself from legacy residential architectures and factories into an artsy area, housing bars, cafes, crafts shops, design studios, galleries and boutiques. It is ardently supported by crowds of yuppies, trend setters, designers and expatriates, who fall for temptation of old Shikumen houses (stone-framed-door houses) and lanes with infinite novelties. Enjoy the breakfast at hotel and check out by yourself. Our English Speaking Assistant and driver will meet you at hotel lobby with your name and send you to airport or train station.